I've ported the TV-B-Gone code to run on the Arduino board. If you haven't seen a TV-B-Gone, it's a cute gadget that you point at a TV that's bothering you, and it turns the TV off. Internally, it's an infrared remote that broadcasts more than 100 different off codes that work on almost any TV. I figured it would be interesting to get the TV-B-Gone running on the Arduino. I have a new, improved version of the software. Details and download are here. The original firmware stores the codes as compressed indices into tables of durations. See the TV-B-Gone design for details. Unfortunately, the Arduino's compiler didn't like the zero-length array in the IrCode structure, so I needed to rewrite the long file of codes to include another level of indirection. 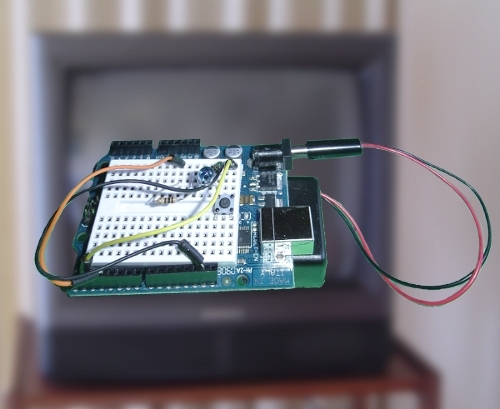 To use the Arduino TV-B-Gone, point the IR LED at your TV, push the button, and your TV should turn off when the circuit hits the right code, which could take up to a minute. The visible LED should flash for each code that is transmitted. If the circuit doesn't work, use a cellphone camera to verify that the IR LED is transmitting. Don't expect more than a few feet range unless you use a transistor to increase the power. The code will print debugging output to the serial port if you set DEBUG in main.h. Is the Arduino TV-B-Gone practical? If you want a TV-B-Gone that you can carry around to amaze your friends, the kit or product is much more compact, has high-powered IR outputs for longer range, and is nicely packaged. However, the Arduino platform is convenient for experimenting, and many people already have it, so I expect people will find it interesting. You might wonder why I'm not using my Arduino Infrared Library for this project. Actually, I plan to at some point, but I wanted to get the straightforward port working first. In addition, my library will need some extensions to support all the codes that the TV-B-Gone supports. I hope you enjoy the Arduino TV-B-Gone, and remember to use it for good, not evil! Great work! I've been waiting for this since I first laid eyes on the Arduino and the TV-B-Gone. I loved this so much i built a PCB for it. this is neat, but could you make a version to turn every tv to the discovery channel? Imagine a packed sportsbar on the big game switched over to mythbusters! Blowed 'em up real good! I've added sleep() to this, as leaving the arduino running full bore, all the time, the batteries wouldn't last long! Re ladyada's four LED model (1.2). Unless I'm mistaken, the PNP transistor that drives the four NPNs will introduce an inversion in the output. Am I misreading the schematic? Is this an issue? Or does she provide inverted input to the PNP in this model? What could be the range with one IR led ? It seems the EU codes are disabled by default. You can add "#define EU_CODES" to the beginning of main.h to enable them. Does anyone know if the codes work on Stereo equipment rather than TV's? The EU_CODES seems to be broken. iv added the define for that EU codes and it is running through like 120 of them but none seam to switch any of the tvs off in my house, could it be a timing issue? two of them where me hehe, it runs fine but does not turn any tvs off, should i try it on a few more tvs? @russdx: I haven't tried the Arduino 328 mini, so I don't know if that's causing the problems. My first thought was the frequency might be different, but the 328 mini and the Duemilanove both run at 16 MHz. My second thought is the pin connections might be different with the mini, so make sure you're actually getting an output from the IR LED. (You can use a cellphone camera to see the IR.) My third thought is that the EU code might not be working (since I didn't test it at all, not having European televisions lying around). Have any of my European readers managed to get the EU codes working? It's also possible the codes just don't work with your TVs, but that seems unlikely since the TV-B-Gone has so many codes. You could try the US codes and see if that works any better. I've just tried your TV-B-Gone with a duemilanove (so atmega 328P) and worked very well with my french TV (so EU codes worked fine for me). Thanks a lot ! Since i'm planning to organize a workshop to build your arduino tvBgone, i'd like to know if it works with Atmega168. Because they're cheaper than the 328P and would reduce the workshop participation fee. Is it working well on ATmega 168 ? The EU codes were not working properly. Mitch Altman and I have made some improvements to the code; among other things, the European codes now work. See Improved Arduino TV-B-Gone for details. Works very well for me, thank you! Hey. Which compiler do you use??? How could you include main.h and so on??? If i load TVB.pde a have millions of mistakes. Could you help me please. I am using BoArdino that I made in Mitch's "Arduino for newbies" workshop. I would like to run this on 3.3v 8MHz arduino. Seems timing will be an issue. What you would recommend? I am from India, and trying to make this circuit. So do I need to put India codes for this, as I can see north america and European codes or is this an universal circuit? I have not put the code in the libraries folder, but inside the sketchbook folder, still getting the error. Actually, it works with my Arduino Uno, but not with the Nano. Oh, and this new sketch also works with Leonardo. Did Ken Shirriff ever port his TV-B-Gone Code over to use his Arduino Infrared Library? If so, anyone with a URL to the ported code? No, I never ported the TV-B-Gone code to use my IR library. It worked fine without it, so I didn't see the point. Has anyone experimented in removing all the 38Khz timing code from the sketch, and switch the code over to use the library Ken has supplied, and then using an lm555, triggering pin 4 on the lm555 which supplies the 38Khz modulation, and frees the arduino to ONLY be responsible for sending the code bits? This should allow us to simply use the lirc codes, and be any to choose any and all codes from there, and it simply becomes, "plug in the code and play!" hi, does this work on an digispark? I have put the latest version of TV-B gone on a solderless breadboard. Using only one IR LED thus far but will add more and spray IR stuff from a great distance. I am using direct drive from pin 3 on my Uno with a 10 ohm resistor in series with the LED to ground. Might add 2N2222 transistors instead of the direct from the Uno pin #3. I also changed the pinMode for the NA / EU option to default pulled up rather than rely "floating" which could change while running due to all sorts of stuff. Temperature change, RF interference, static charge etc. pinMode INPUT_PULLUP worked with out problem. Only problem so far is that for my Sony TV it turns the TV off and then shortly after turns it back on again. And quick test of another TV, a Visio gets no action. Further testing on that is needed. Would be cool to serial.print (while debugging) the BRAND NAME as the codes are output by the LED. I wish the codes were commented by brand in the list. The construction of codes is not really user friendly. It must have been terribly tedious to come up with the format. But happy to know that my initial try is 99.9% functional. See me smile. And I can see using Serial.print whats going on but it's too fast to really read. Anyone got an idea of where / how to put a conditional delay statement in it. I tried to insert a DELAY (1000); it didn't work. I thought I took that out but now getting a compiler error. I probably typo'ed the code. I shall now replace the stuff in the library and try again. And. . .has anyone made TVB Gone work on a Nano? I'd love to have the small physical size. After a bit of "no that didn't work either..."
// ^^^^^^^^^^^ ONE SECOND DELAY.